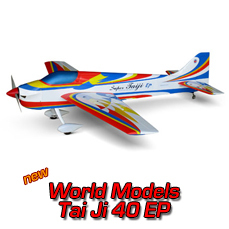 Want something a little more aerobatic than a standard J3 Cub ? If so this is the model for you, please read on? 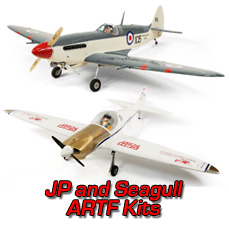 It goes without saying that World Models are the Piper Cub A.R.T.F specialists, just take a look at the range of different Cub models available on this site. Top quality balsa and plywood construction. The model is all built up and this adds to the scale appearance. The model comes with all hardware and accessories. We have seen examples flown with Enya 41FS, Enya 53FS,OS52 and SC52 engines and the model looks really good in the air! This very model is featured in the RCME June 2006 issue. 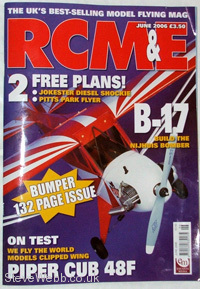 The model is reviewed and also features on the front cover. Available in two color schemes: (Red / White Sunburst) or (Blue / White Sunburst as per this listing). Please see our other aeroplane listings for more cubs. Wing Span : 63.0 in / 1600 mm . Wing Area : 620 sq in / 40.0 sq dm . 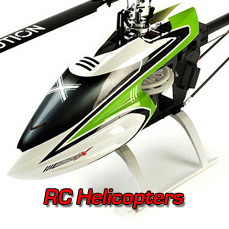 Flying Weight : 5.5 lbs / 2500 g .
Fuselage Length : 47.0 in / 1190 mm . Engine Required : 2C 0.40 cu in . 4C 0.52 cu in . Want something a little more aerobatic than a standard J3 Cub ? If so this is the model for you! 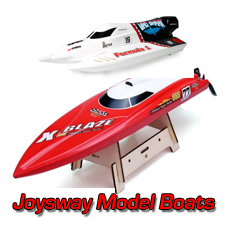 Top quality balsa and plywood construction. The wings are built-up for scale appearance, just like the real thing. The model comes with all hardware and accessories required. As usual you still need to add a radio and engine of your choice. We have seen examples flown with Enya 41FS, Enya 53FS,OS52 and SC52 engines and the model looks really good in the air! Available in two color schemes: (Red / White Sunburst as per this listing) or (Blue / White Sunburst). Please see our other aeroplane listings for more cubs.